I figured I would start an official thread for Ace to track his progress and achievements. I have no idea just how far we will go, but we are going to have a great time along the way! Ace started with the AKC Puppy Star award, and we hope to achieve at minimum the following goals and titles in Ace's lifetime. As of today, Ace has already knocked two of those off his list! 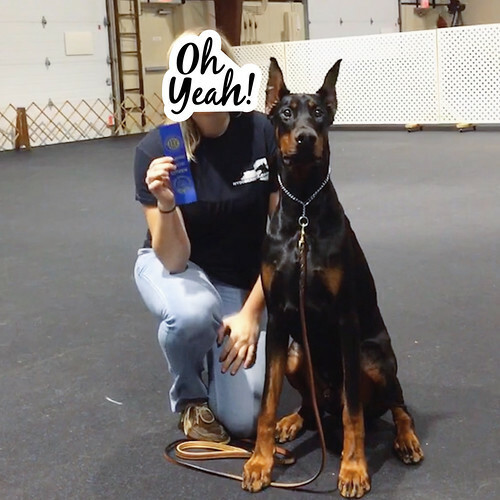 Say Hello to Vom Haus NY Dobermans Ace's Wild CGC TKN!!! Ace earned his Canine Good Citizen title last night, and after that we earned our Trick Dog Novice title too! I ran him for a little too long before class, so by the time the CGC test came around, he was done with all of it. It wasn't the prettiest CGC, and I never realized how bad my "ring" nerves are, so my stress wasn't helping matters. All in all though, we were given a passing score for each test item. We still have plenty of things to work on, but I think I truly lucked out with having this dog to introducing me to the AKC world and training. He's the smartest, most wonderful puppy I know! (Not biased at ALL! Lol). This dog means the world to me, and I can't imagine a day without him.